Every Aussie backyard needs a lawn. They are the centre of everything from backyard cricket, to kick-to-kick and even just lying on the grass and watching the clouds go by. However, Victoria does have some difficult weather conditions, from long baking summers to wet and windy springs and of course, morning frost in the winter. So, to ensure you end up with a lawn that will last, you need to put some thought into choosing the right grass. What Makes A Good Grass? Of course, you need to take all of this into account, but you also need to make some trade-offs. Fr example, if you want a particular type of feel, you may have to choose a grass that will brown off in summer or suffer a bit in winter. Climate: This question shouldn’t be too hard to answer as you’ll have a reasonably good idea of the types of weather patterns your home exists in. Do you get much rain? Do you experience frequent early-morning frosts and does your backyard get fairly consistent sun? If you live in the Melbourne Metropolitan area, there isn’t a tremendous amount of variation in the suburbs. 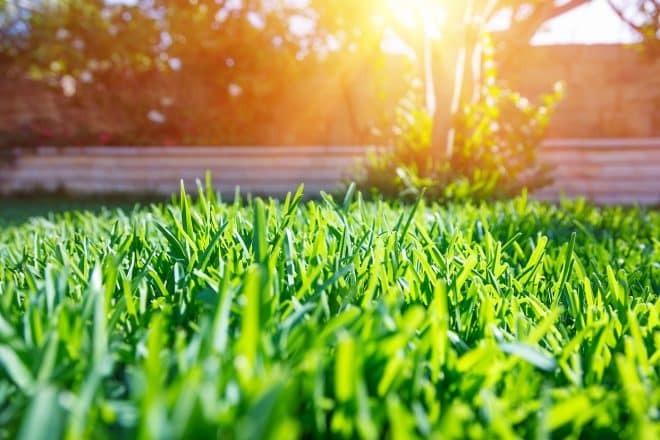 However, if you live in the Dandenongs, along the coast or up into Central Victoria, you may have to put more effort into your grass selection. Use: Different lawns have different purposes. Some are purely decorative, while others become the playground for kids, pets and adults. Some grasses are hardier than others, so make sure you choose the right grass for your application. Soil Type: You need to check the acidity of your soil by doing a pH test. You can find test kits at most home improvement stores, or ask your lawn installation contractor to carry out one for you. If you have well-drained soil, with a pH level of 5.5-6.5, you’re in luck because you can grow most types of grass. If you fall out of this range, or your soil contains significant amounts of clay or sand, your options may be more limited, or you may have to doctor your soil a bit. Do You Want Seed or Turf? : This isn’t a question of grass type, but more a question of time, space and budget. Turf is more expensive, but you do get instant results, making it great for small, decorative portions. Seed is perfect for large areas and a lot cheaper, but you will have to wait to see the fruits of your labour. So Then, What Is The Best Type of Grass? Buffalo Turf: Buffalo turf has become a popular choice for Melbourne homes because it is both cost-effective and easy to install. Best of all, it is beautifully soft and vibrant, while still being hardy enough to last all year round with minimal maintenance required. This is an excellent lawn for families, and the kids will love rolling around on it all afternoon. Palmetto Turf: Offering all the softness and low-maintenance of Buffalo with the added benefit of being low-irritation. This is great for a family with allergies, or anyone that prefers their grass to be a little less scratchy. Synthetic Grass: Ok, this isn’t real grass, but it does look exactly like the real thing. The thing that is so often glossed over about lawns is that they take time. All those incredible lawns you see on Instagram are the product of hours of labour, and many lost weekends. If you don’t have time for that, go synthetic and just set and forget. Grass Pavers: This is an excellent option for the modern home. In the past, you had to choose between pavers or grass. Well, you don’t have to do this anymore. Grass pavers let you enjoy both at the same time. You can either have the pavers sit underneath the turf, or have pavers that lie within the turf and remain visible to the eye. Both look great and help to hold your lawn together and increase its lifespan.